I was waiting to meet up with a friend for dinner and used the time to start a sketch of the lovely old Victorian shops in the stripe the restaurant was in. It was still too cold to sketch outdoors so I did the next best thing and wound down the window of the car, switched on the seat heating and the stereo, almost outdoors but with all the comforts, felt a bit like cheating, but I was too comfy to care. It was right on dusk so I did not have much time to get the basics down. I am using my new Japanese pens, I found a new website (which may be going to cost me big time) called Jet Pens through Sketch Book Skool and bought just a couple of things. The new pens are Kuritake Bimoji Felt tip pens, they just have to be good with a name like that. I also received some very special Japanese brushes for my birthday too. Kazan Mahogany mop head brushes. I asked for the number 2 and 6 and they are huge, but soooo divine. I will be drawing them soon and will share some photos with you. These two little terraces stood out for me as the tops were still original Victorian with the contrasting brick colours, while the bottoms had been renovated and were painted black. A very ugly job but interesting juxtaposition between the colourful old and monochrome new, Melbourne is renowned for these colourful brick patterns, luckily we had a number of different clay colours close at hand which is apparently unusual. The other news is that I will be off to Bali for 10 days where I will be taking part in a drawing retreat. Can’t wait to be in the sun and spend time with other arty people. I will be sending you some drawings from there next week. 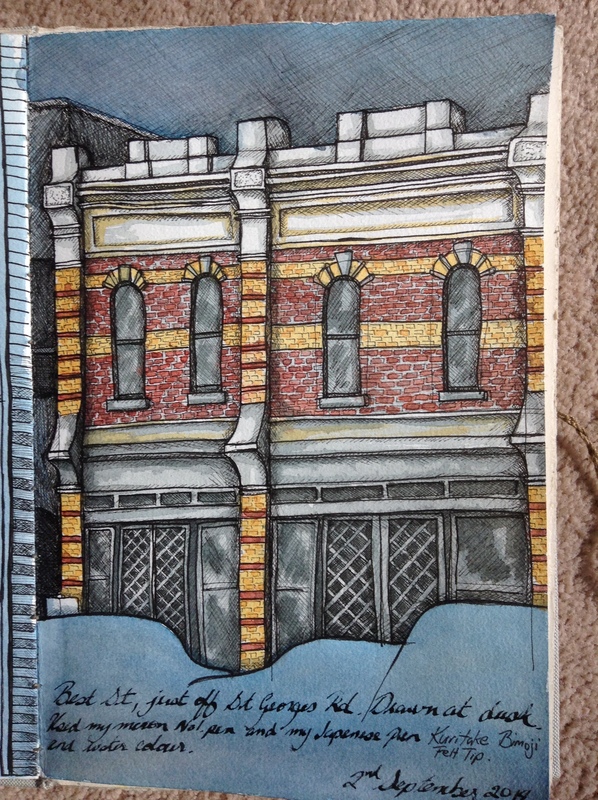 This entry was posted in 2014 Artwork, Art Materials/Supplies, Journal, What inspires me and tagged art, colour, drawing, drawings, Dusk, Fitzroy, journal, sketchbook, sketches, sketching, water color, watercolour. Bookmark the permalink. Absolutely love it. Inner city terraces are gorgeous – as is your drawing of them. Karen, this is such a lovely sketch! I can’t wait to see what will come from the Bali trip. Bali+new tools+Karen= incredible art! It’s Bali! What clothing is needed? Increase those art supplies! Hope you have a lovely holiday. I should think there will be such a lot of lovely things to paint in Bali. Thanks Chris, I am sure there will be lots of amazing things to draw, it is always so much to draw and so little time. Karen.